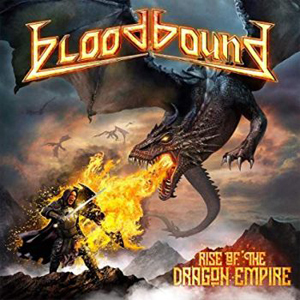 The Swedish power metal outfit BLOODBOUND can certainly not be accused of being lazy. Founded in 2004, the six-piece have now released their eighth studio effort, Rise Of The Dragon Empire. The spotless production sound was once again in the very capable hands of Jonas Kjellgren, who was also responsible for the mix of the previous four BLOODBOUND albums. Musically, singer Patrik J. Selleby, guitarists Tomas Olsson and Henrik Olsson, keyboardist Fredrik Bergh, bassist Anders Broman and drummer Daniel Sjögren pull all the stops to achieve exactly what you expect from an easy-to-listen to metal album, very much in the vein of NIGHTWISH. The album abounds in ultra-melodic hooklines that sound awfully familiar, somewhat predictable chord progressions, nordic folk elements especially in the vocal lines and keyboard parts, neo-classical shredding and lots of sonic sugarcoating, which is part and parcel of the genre. So everything falls into place on Rise Of The Dragon Empire – the songwriting follows the usual formulas and there is not one bad song on the album, meaning everything is worked out to perfection. Check out the melodic richness on “The Warlock's Trail“, the symphonic keyboard intro to “Magical Eye“ and the relentless mid-tempo groove that invokes memories of NIGHTWISH‘s “Nemo“ (and lots of other stuff), or the high-velocity lead guitar work on “A Blessing In Sorcery“ – fans of the genre will be delighted. The quality of the songwriting and the musical performance are very much on par with the giants of the genre, RHAPSODY OF FIRE, DRAGONFORCE, NIGHTWISH et al. However, if you look for something new, something unexpected, a twist in the tail, you will not find a terrible lot of any of that on Rise Of The Dragon Empire. There is “Breaking the Beast“, which has a slightly progressive attitude in small doses. And that‘s about it. Even the atmospheric nordic folk elements on the concluding “Reign Of Fire“ are reminiscent of NIGHTWISH‘s “The Islander“. But maybe this genre is not necessarily the place for unconventional music. Thus this release – as perfect as it is in many ways – may appeal to fans of RHAPSODY OF FIRE and the like but may not go down too well with metallers who are looking for a bit more action and something with a bit more cutting edge.